“For me, being a librarian is very important. Besides being in charge of the library, I can also contribute to activities carried out inside, such as reading activities. The librarian reminds teachers about the scheduled library period, reminding students of library rules, notifying students about the level of the book, how to borrow and return books. 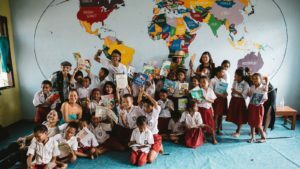 Often I ask students, ‘if the book is borrowed, take it home, who do you read with?’ They also answered, ‘Read with Mama or Papa.’ “A smile rose from Mrs. Margareta’s face as she told about her students and the library she loved. 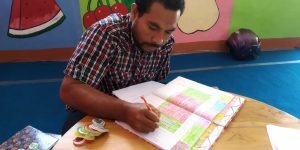 For a teacher, it is not easy to teach unless they have the provision or ability to teach. Likewise, when deciding to become a librarian, they will have difficulty managing the library unless given proper training. 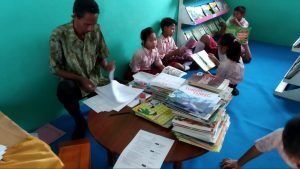 The Child-Friendly Library Program from Room to Read adopted by Rainbow Reading Gardens to build access to books in the Eastern Indonesia region provides training for Rainbow Reading Gardens partners, namely the school. 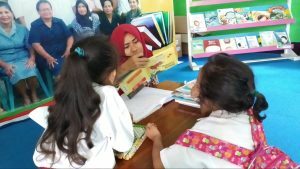 Schools in collaboration with Rainbow Reading Gardens need to provide librarians who will be responsible for library management and help run child-friendly library programs. 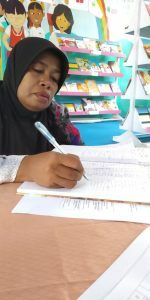 Librarians are given training on the registry, namely the Master Book, Book Check out Registry, Reading Activity Registry, and Visitor’s Book. 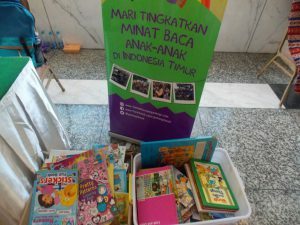 In addition, they also need to know and explore the concept of the child-friendly library, which is a library that makes children feel safe and comfortable to read children’s storybooks that will be available in each school library. 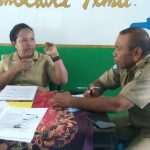 One concept of child-friendly is the importance of adult behavior and attitudes when dealing with students. 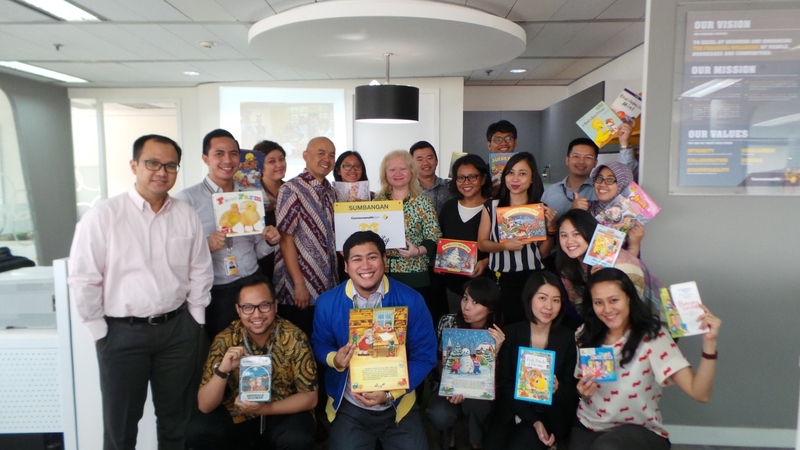 With friendliness, caring, and positive interactions by adults (Principals, Teachers, and Librarians) to encourage students to know books, want to read books, often read books, and finally enjoy reading books. 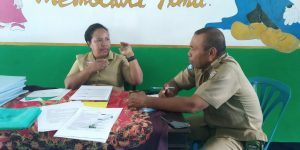 Although the library management workshop has been conducted, it is never easy to perform the role. As early as being a librarian, some thought the job was boring, sitting while waiting for the children to read and borrow books. It is also overwhelming because some are not full-librarians (playing roles as both teacher and librarian), so they have to sacrifice one of those jobs, and often the duty of the librarian is sacrificed. But, above it all, after some time, they finally realized the importance of being a librarian. Even some of them are willing to become librarians as the job turns out to be exciting. Teachers and Librarian Working Together. Left to Right: Bapak Ralam (teacher), Bapak Klementinus (librarian), Bapak Vitalis (teacher) Bapak Simplisius (teacher). Many librarians often know the names of students from all classes, while teachers only know students from their class. When interacting with students who borrow books, librarians remind the students to return on time, and always teach about the importance of honesty that if the book is damaged, it’s better to return them to the librarian, rather than being said as lost. Although they are slightly annoyed, the librarians know which one is more important. The book is better damaged after it is used by students rather than neatly printed. Librarian is a hand for students who love books. 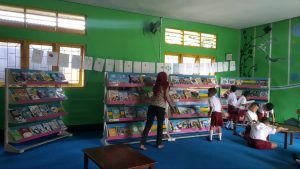 From librarians getting acquainted with the children’s books, to librarian seeing the children looking at the books with their sparkling eyes and began to murmur the text they read. They feel touched and extremely happy when children often read in the library and borrow books, and all the hard work pays off. Students are more confident when speaking because they have a lot of vocabulary. 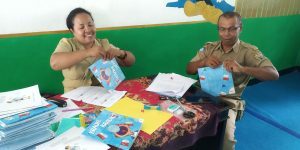 In some schools partnering with Taman Bacaan Pelangi, the positive learning outcome was due to the availability of quality children’s books, as well as the behaviors and attitudes of adults who manage them well. Keep being high-spirited as a Hand for Students to Love the Book. It’s Fun to Be Student Volunteers!